According to the Kentucky Office of Drug Control Policy, prescription drugs cause more overdose deaths than all other substances combined including cocaine, methamphetamine, and heroin. To address this increasing problem, the Kentucky Legislature enacted House Bill 1 in 2012 followed by House Bill 217 in 2013. Measured impacts have seen the total doses of all controlled substances dropping over 10%, several facilities identified as pain management clinics closing or discontinuing providing pain management services, and KASPER utilizations have dramatically increased. 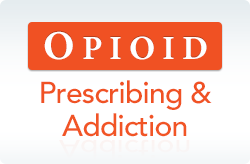 The modules included in this site are intended to help the prescriber identify and screen for substance use disorders, use KASPER and urine drug testing therapeutically, recommend and understand treatment options particularly for vulnerable populations such as opioid dependent pregnant women, and improve their medical understanding of addiction as a chronic relapsing illness deserving of medical treatment. This website provides a vital link for Kentucky health care providers, court officials, families, and individuals seeking options for substance abuse treatment and recovery. Find Help Now KY (www.findhelpnowky.org) delivers real-time information about available space in substance use disorder treatment program and guides users to the right type of treatment for their needs. This is a project of the Kentucky Injury Prevention and Research Center (KIPRC) at the University of Kentucky College of Public Health, a bona fide agent of the Kentucky Department for Public Health. The project is in partnership with the office of Kentucky Gov. Matt Bevin and the Kentucky Cabinets for Health and Family Services and Justice and Public Safety. The site, funded by the Centers for Disease Control and Prevention (CDC), links to Kentucky’s current, “Don’t Let Them Die” website. The Find Help Now KY website also includes the statewide hotline number (1-833-8KY-HELP) for direct assistance. Find Help Now KY features a near real-time treatment opening locator for substance use disorder (SUD, commonly known as addiction). The locator guides individuals to available SUD treatment openings based on the type of treatment needed. It takes into consideration the substance(s) being used, payment options including commercial and public insurance programs, gender identity, preference for in- or out-patient treatment, and needed co-occurring treatments such as mental health care, plus 30 more criteria. The site provides daily availability information for treatment openings, to enable rapid admission to addiction programs. The Find Help Now KY landing page also allows high priority populations, such adolescents and those who are pregnant, to find treatment availability options more easily. “Near real-time availability of SUD treatment openings will significantly reduce the time spent by the public, healthcare providers, and other healthcare professionals searching for treatment openings by matching available treatment with individual needs,” said Terry Bunn, PhD, KIPRC director. Find Help Now KY also contains an information library on substance use disorder treatment and prevention topics, as well as on exposure to opioids. The Find Help Now KY information library caters to individuals and family members, primary care providers, first responders, public safety, and to public health personnel. Kentucky teens will play a leading role in promoting awareness of Find Help Now KY. High school teams will be challenged to produce campaign ads that promote “Find Help Now KY” website within the “Don’t Let Them Die” website and raise teenage awareness of the risks of drug use. The top student-produced print, broadcast, billboard, and radio ads will be incorporated into the state’s overall marketing campaign to promote the “Don’t Them Die - Find Help Now KY” websites throughout Kentucky. The campaign ad competition, funded by the CDC, will be open to all high school students, grades 9-12. For information on the ad competition, the link to the competition description and rules can be found at http://dontletthemdie.org/docs/Rules-Guidelines.pdf.